Refund delays have been occurring more and more frequently due primarily to thousands of audits being conducted by the IRS and general backlog due to the staff reduction and budget cut. As such, the IRS has been freezing refunds as they review hundreds of taxpayers’ accounts. We have been seeing delays of 6 to 8 months and longer for refunds to arrive. Once the minimum 6 month IRS processing period has passed, at a nominal fee our office can contact the IRS (by phone or mail) to ascertain the status of the refund on your behalf. Both we and the IRS require a Power of Attorney form signed by the taxpayer/spouse. 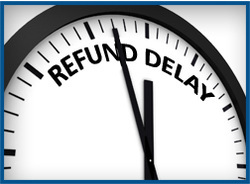 The additional steps to the “Refund Delay” process includes writing letters to the IRS to request expedition of the refund and if not successful, we then will process a Taxpayer Advocate request for assistance, which might require submission of additional documents. Depending on the information gained from the IRS tax transcripts, our office will determine the best steps to take for the quickest, most beneficial outcome.